In this fast-paced international television special hosted by David Frost we meet Billy Graham and hear in his own words about his unprecedented opportunities and the formidable challenges that marked major turning points for him. Documentary footage, Dr. Graham’s own explanations, and comments from friends, associates and critics provide insight into one of the most unusual and influential lives of our era. Fullscreen. A TV special hosted by David Frost that presents highlights of the life and ministry of Billy Graham using documentary footage, comments from Billy Graham himself, from his friends and from his critics. Includes his view on race relationships, the Vietnam War, his crusades and his work and relationships with the presidents. For anyone looking of information on Billy Graham, this is a good source. Fast-paced to keep the interest of viewers, opportunities and challenges of this ministry are addressed. 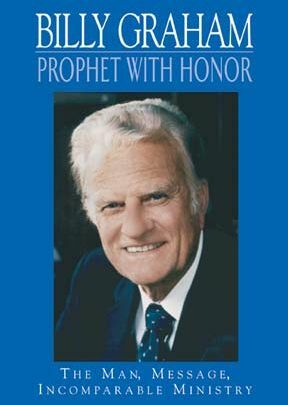 Billy Graham has been called a "prophet with honor" because of his universal appeal as an evangelist and godly man of integrity. Hosted by David Frost, Prophet with Honor focuses on Graham's impact on history, politics and world events. The interview with Graham provides insight into his relationship with government leaders and the role he played in their administrations. There is also commentary from both supporters and critics of Graham's ministry. The video is at its best when it allows Graham to tell his own story. Frost asks challenging questions and the answers provide a glimpse into the man behind the phenomenon. Admires of Graham will enjoy this look at his place in history. David Frost can be the consummate interviewer, but give him an interview with Billy Graham and the result is a masterfully-done production. Through photos, video clips, and the spoken word, this video gives a thorough background of the man would call the evangelist for an eternity. There is no doubt this video should be in the library. It shows the man as well as the evangelist.